The first federal trial for former Trump campaign chairman Paul Manafort is set to start tomorrow in Washington D.C. Leftists are salivating over what the trial could reveal about the 2016 presidential election, alleged Russian collusion and Manafort's relationship with President Donald Trump. But according to a new report from the Associated Press, they're likely to be disappointed as the trial will focus on Manafort's business dealings and lavish lifestyle, not collusion (bolding is mine). 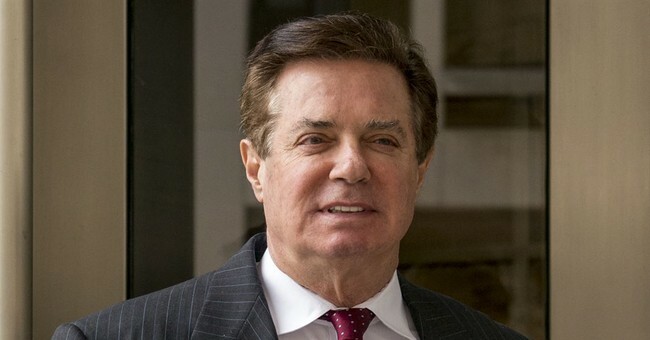 The trial of President Donald Trump’s onetime campaign chairman will open this week with tales of lavish spending, secret shell companies and millions of dollars of Ukrainian money flowing through offshore bank accounts and into the political consultant’s pocket. What’s likely to be missing: answers about whether the Trump campaign coordinated with the Kremlin during the 2016 presidential election, or really any mention of Russia at all. Paul Manafort’s financial crimes trial, the first arising from special counsel Robert Mueller’s investigation, will center on his Ukrainian consulting work and only briefly touch on his involvement with the president’s campaign. The focus on Manafort's personal dealings, rather than Russia, aren't surprising considering the Special Counsel indictment didn't mention the Kremlin, the 2016 presidential election or collusion a single time. The list of felonies Manafort is up against, which is quite long, are irrelevant to President Trump. He faces twelve different counts, all felonies, which include conspiracy against the United States, failing to register as a foreign agent, making false statements about being a foreign agent, false statements to the Department of Justice, tax fraud, bank fraud, money laundering and more. His longtime business partner Rick Gates faces many of the same charges. The charges stem from Manafort's activities from 2006-2017.